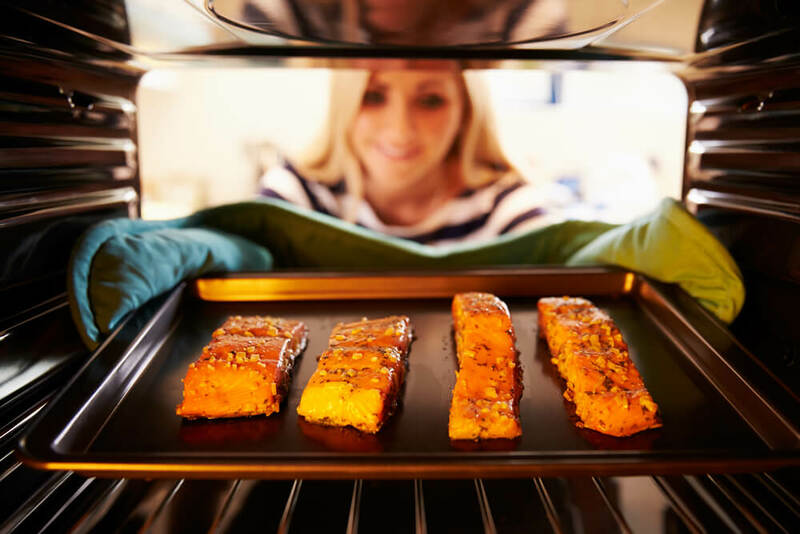 Add ingredients for this amazing salmon recipe to your diabetic shopping list! Life can be made easier by our diabetic shopping list. For those who have diabetes, creating a diabetic food list can be challenging as well as following through and eating the right things to keep blood sugar levels in line. Those who have diabetes should look at their eating more as a meal plan instead of a diet. When creating a type 2 diabetes food list, it should be low in carbohydrates and high in protein, fiber and vegetables. Carbohydrates should be avoided because although they don’t look like a cookie or taste sweet, they can be just as dangerous. Carbohydrates are broken down into sugars after consumption which means that they can easily raise blood sugar levels affecting quality of life. Continue reading to hear our recommendations for a diabetic shopping list to create one delicious meal and inspire you to continue using similar ideas to create other delicious dinners. Click here for more diabetic recipes. When it comes to a type 2 diabetes food list, you can’t just put anything on it. Here we’re going to focus on one recipe that is simple to make contain easy ingredients from thee diabetic shopping list. Before leaving your house to go shopping, take a look at what is on your list and take a look at what you have at home. This will not only save money but time, avoiding buying doubles of things that you already have. On the other hand, if you like to meal prep or have a large family, double the recipe ( most are for 2 servings) to have left overs or more portions for other family members. Mix together barley, water and garlic in a pot. Bring mixture to a boil and then reduce heat to simmer and allow it to simmer for 40 minutes to an hour. You will want to make sure that almost all of the water has been absorbed and that the barley is soft. Make sure to take out the garlic clove before serving. Begin to prepare salmon after the barley mixture has been cooking for around 20 minutes. Make green sauce (recipe below) while everything is cooking. Assemble Salmon with green sauce and green beans once everything is done. Not only does this recipe sound delicious, the green sauce can be used on top of other types of meats such as chicken or beef. Following simple ingredients from a type 2 diabetes food list can make meals more gourmet and help you eat healthier. Can Carbs Be Part of a Healthy Diabetes Diet?